Edited 1 time(s). Last edit at 2011-01-31 19:11 by King Bee. My two babies - Fender Esquire (one of the first Japanese built from mid 80s) and a Gretsch 6120DSV. Edited 1 time(s). Last edit at 2009-07-14 19:30 by Roadster32. Is that a factory installed Bigsby? Edited 1 time(s). Last edit at 2009-07-11 19:49 by fuman. King Bee, can you tell me about those Alden guitars? Like a super hard objective review? Please? Yow funman! That's a great collection! My Les Paul is 1998 R8. The Bigsby is not factory installed as I put it on but I can see yours is a factory job. Tell me about your Historics please! Edited 1 time(s). Last edit at 2010-09-30 16:05 by Beelyboy. Could you post some pics Beely? fender was sanded and now has BEAUTIFUL natural wood finish...man i love it. And I´m very happy with this guitar, and thinking about getting another Edwards, so any info about your goldtop would be welcome. Edited 1 time(s). Last edit at 2009-07-12 02:17 by mickijaggeroo. Edited 1 time(s). Last edit at 2011-04-13 15:09 by Palace Revolution 2000. Your R8 has nice figuring. Perfect. Nice Strat too. I had an early '80's Squier Strat, but gave it to a buddy years ago. Wrapped it in lots of bubble wrap, put it in a box, and mailed it to Oregon. Needless to say, he was surprised when it showed up. Miss that guitar now, oh well . . . 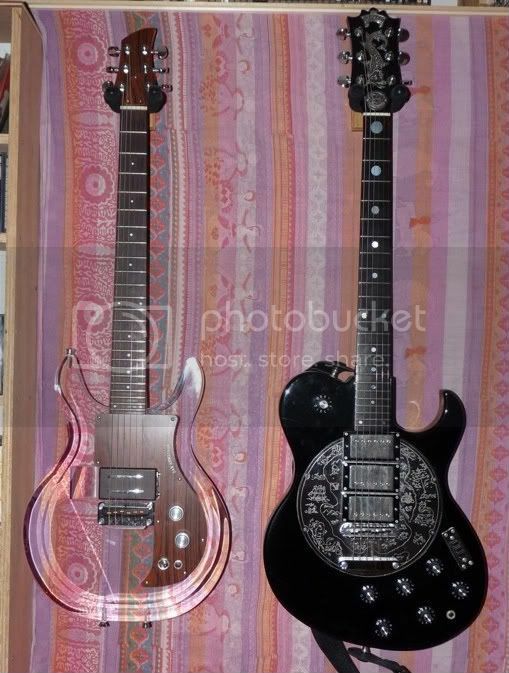 The left is a 1980 Standard 80, with Tim Shaw Humbuckers. I had it serviced through Gibson back in 1999. They put on a new neck (ouch) because it was twisting, and they touched up the finish. So it's modified, not investment quality. Nice thin neck, super sweet tone. The right is a 2003 58 reissue, and I also put Tim Shaw double white humbuckers in that one recently. It came with Burstbuckers 2 and 3 (my fault to specify) which were way too hot. Pretty fat neck, which is a great change for me. Nice to have a totally different feel, forces me to change style (slightly). The 2003 is all I need, but now's not the time to sell so I'll hang on for a while (years?). i've a 1961 Fender Jazzmaster, bought used at Manny's in New York in the sixties. Aha .... I spy with my little eye a mention of "travel guitars". I travel all the time for work, so taking something small & light with me became a major issue. Had a brief look at a Baby Taylor in a guitar shop in SW London, but then in the course of further surfing the net extensively in pursuit of other types of travel guitars, eventually settled on this. For those who live in the U.K. I can highly reccommend this place for all things "travel guitar", he stocks just about every model range from every manufacturer, it's great to have 'em all under one roof. Funman, the 2003 Historics did indeed came with Burstbuckers. I believe that up until 2001 the Historic line came with '57 Classics, after which Burtbuckers were used. Up until 2001 as I recall the R8s came with figured tops but went plain after that, presumably Gibson wanted to save the figured maple for the more coveted R9s Do you post over on the Les Paul forum by the way? I'm also dig your acoustics. I've always wanted a J-200 or J-150. Is your J-200 a 70's model? The bridge is fairly representative of that era. Haven't found a pic of my fender yet, but here's the Taylor travel guitar holding me up in a performance in L.A. last Friday...dimarzio clip-on pickup...kyser capo on Fret 1. new song i'm still working on tentatively working-titled "Ride"
Edited 1 time(s). Last edit at 2009-07-14 20:32 by Beelyboy. very nice instruments ,can you tell me about your two tone sunburst strat it looks like a fender custom shop alder strat ,and what kinda pickups are you using in both the les paul and your strat? Can you share some pics nanker? mexican version great copy gets out of tune though : any suggestions on that ? with all those instruments around my home could be defined as a "music home" if you know what i mean..
sometimes you come ito a home with no instruments and you feel bad ! audun, I see your online, please see my post above. I will have to try, I dont have any yet. I have just got married, moved, and I have no clue how to work my wife's camera!!! let alone download pics. But I will have to see If I can get her to help. My z made the move but the other three are waiting for a place to be cleared for them in my new home! So I may only have on pic. The Edwards Goldtop is a very nice guitar. 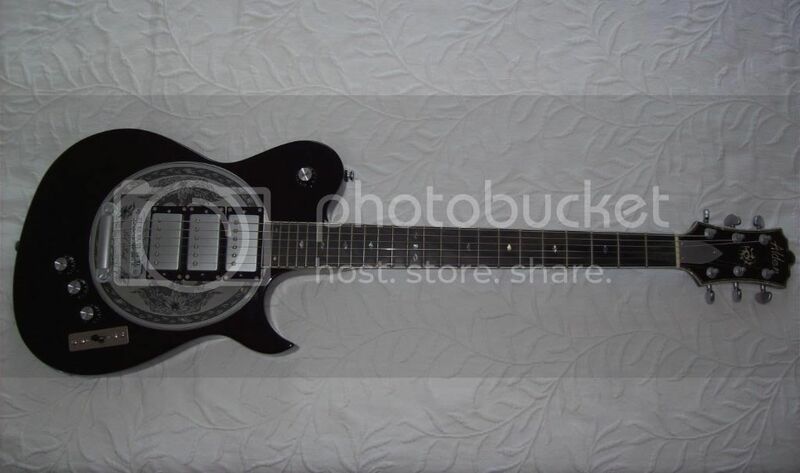 I've adjusted it to my own likings, and it plays just as good as my original Les Paul. (different neck-profile set aside.) The PU's was replaced with Lindy Fralins when I bought it, and I can't imagine this was for the worse as it sounds amazing! It is built very well and if one can't afford the original (or simply won't spend that much money) the Edwards is surely a "bang for the buck"! Wouldn't hesitate to buy another Edwards! Have been looking for the Edwards "Keith-relic" that you have, unsuccesfully though. Hi Greek. The Les Paul has stock '57 Classics. I replaced the control pots with a vintage style set from RS Guitar Works and wired it with '50s style wiring, which really worked wonders on the tone as the stock pots were linear tapers instead of audio tapers, which allow much more control over tone and volume. I flipped the neck PU's magnet so as to get an out of phase sound when both both PUs are turned on. As to the Strat, it's a CIJ (Crafted In Japan) '57 Reissue model made in 2005. The PUs are stock and I quite like them but like the Les Paul the control pots need to be replaced with audio tapers which I will do sometime in the next few weeks. I have to say that the Strat is versatile guitar and it has great tone, despite the pots.